Lovingly reared in North Philly’s little Italy in 1967, Petty Officer Gallo was one of 100 Communication Technicians called “spooks” aboard the USS Liberty: America’s most decorated ship for a single engagement. On 8 June 1967, without any warning the Israeli Defense Force’s aircraft and torpedo boats deliberately attacked and brutally killed 34 unarmed Americans: 31 sailors, 2 marines, 1 NSA civilian. Israel’s wonton attack also wounded 174 U.S.A. troops who were then ordered to shut up about their experiences on that day in infamy when President LBJ recalled rescue aircraft and ignored the Israeli War Crime of machine-gunning all the life rafts on the unarmed vessel. Gallo writes with intention and challenges every American who claims to support the troops—to do something to prove that support in deeds! 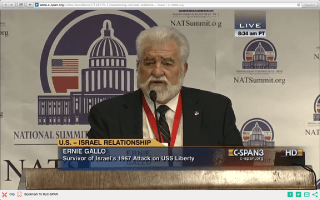 As a result of the public relations campaign undertaken on behalf of Israel, the USS LIBERTY survivors have been vilified for their assertions that the attack was deliberate and for their ongoing quest for justice…. 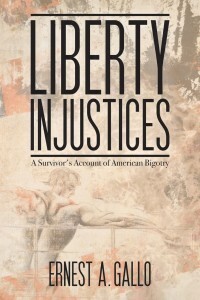 [LIBERTY survivors want] nothing more than an honest, open investigation of the attack on their ship and themselves. In 2003, an independent commission of experts convened including Admiral Thomas H. Moorer, USN, Ret. Former Chairman Joint Chiefs of Staff, General of Marines Raymond G. Davis, Rear Admiral Merlin Starling and Ambassador James Adkins. Among the many issues the experts noted was AIPAC’s influence and “that due to continuing pressure by the pro-Israel lobby in the United States, this attack remains the only serious naval incident that has never been thoroughly investigated by Congress; [and] no surviving crew-member has been permitted to officially and publicly testify about the attack. The first called for a new and true Court of Inquiry to be convened. The second for “every appropriate committee of the Congress of the United States to investigate the actions of the White House and Defense Department that prevented the rescue of the USS LIBERTY” including the NSA, CIA and military intelligence. In July 2009, I finally received a response from Senator Bill Nelson to my many letters regarding the USS Liberty Vets ongoing request for an open congressional investigation of Israel’s attack because our government crucified the truth for “an ally” and gagged all the survivors. There have been numerous investigations of the USS liberty case by both the executive and legislative branches of the government. Immediately following the incident, the U.S. Navy and Deportment of Defense conducted their own separate investigations of the incident. In its oversight role, Congress also investigated. Both the House Armed Services Committee and the House Investigations Subcommittee of the Appropriations Committee conducted separate investigations, which were completed to the satisfaction of the Congress. In 2012, I attended a private meeting among thirty voters with Senators Mike Lee [R-UT], Jim DeMint [R-SC] and Rand Paul [R-KY]. Senator DeMint admitted he was stumped and couldn’t respond. Senator Paul recommended I not focus on old news! I dissent because the “old news” about the USS LIBERTY is what changed America’s balanced Middle East policy to blind allegiance to Zionist policies which endanger this homeland! Two months before the sailor’s mass burial at Arlington Cemetery, Navy analysis also uncovered that the Israeli torpedo boat gunners had targeted the spy ship with 40-mm tracer rounds made in the United States. Gross’s amendment failed, justice remains delayed and American tax payers continue to support the Ethnocratic State of Israel. An ethnocracy is the opposite of a democracy, although it might incorporate some elements of democracy such as universal citizenship and elections. It arises when one particular group-the Jews in Israel, the Russians in Russia, the Protestants in pre-1972 Northern Ireland, the whites in apartheid South Africa, the Shi’ite Muslims in Iran, the Malay in Malaysia and, if they had their way, the white Christian fundamentalists in the US-seize control of the government and armed forces in order to enforce a regime of exclusive privilege over other groups in what is in fact a multi-ethnic or multi-religious society. Ethnocracy, or ethno-nationalism, privileges ethnos over demos, whereby one’s ethnic affiliation, be it defined by race, descent, religion, language or national origin, takes precedence over citizenship in determining to whom a county actually ‘belongs.’”-Page 74. 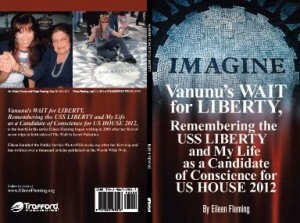 Will you support the establishment of the eighth day of June of every year to be known as USS LIBERTY REMEMBRANCE DAY? THIS POST HAS BEEN READ 11787 TIMES SO FAR. THANK YOU! implicate Israel in wanton MURDER. The culprit who is believed to have given the order, is Israel DM, Moshe Dayan. The Israeli war Criminal went to his Grave unpunished. 2) The US publicly told the world (primarily to reassure Arab countries) that the US had no ships within 350 miles of the war zone. 6) All of this is detailed in the 1967 CIA top secret report, and the 1980 NSA top secret report, both of which were declassified and placed on the internet in recent year. 7) None of these allegations explain why Israel would bomb a ship belonging to its best ally, at a point in time when the hostilities were basically over. This is the final pin prick in the absurd conspiracy theories. 8) Admiral Moore is looking for a scapegoat, since the Liberty being where it didn’t belong was a Navy screw up. no doubt he wants the finger pointed somewhere else. 9) There’s a well known anti-Israel bias in the CIA, they refused to acknowledge Israeli warnings of a large scale impending terrorist attack prior to 9/11. You can find the article from mid September 2001 detailing this if you google “mossad warning 9/11 telegraph” – despite this, the CIA correctly fixed the blame for the USS Liberty incident on US screw ups.